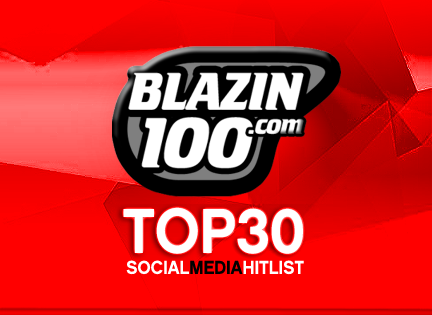 This is the Blazin100.com Top 30 Social Media HitLIST. Chart results are based on primarily online requests, social media feedback, purchases on leading digital stores such as iTunes, Amazon via online station. Send requests and votes via email, Twitter and Facebook. Included in the chart is Taylor Swift - 22. Also included in the countdown is Mariah Carey - Beautiful feat Miguel. Also, check out Jennifer Lopez - Live It Up ft Pitbull. Making its way in the list is Avril Lavigne - Heres To Never Growing Up..
And then there is Ariana Grande - The Way ft Mac Miller. Lawson - Brokenhearted ft. B.O.B.